The intricate floral marquetry of this mirror relates to one with similar sprays of tulips, carnations and other flowers, with acanthus scrolls at the corners (R. Edwards, The Shorter Dictionary of English Furniture, London, 1964, p. 352). Another example, on an ebony ground, is at Ham House, Middlesex. The design of the floral marquetry of many comparable mirrors may be based on engravings by Robert Pricke titled The Ornaments of Architecture, published in London, 1674. 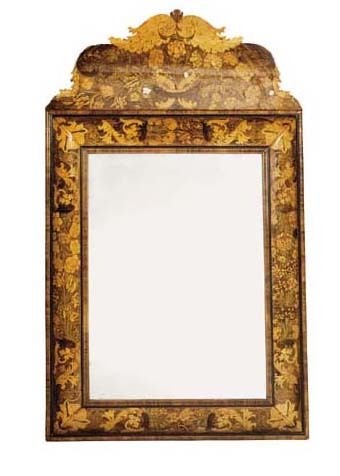 This mirror would have formed part of a set comprising a side table and a pair of candlestands. A rare example of such a set survives at Petworth and is discussed in C. Cator, 'Haupt at Petworth', Furniture History, 1993, pp. 72-79.